The survey settings page is where you set the options for your survey. To access a survey’s settings, hover over the title of the survey in your dashboard and click Design Survey. The survey name is what appears in your folders list and is what is shown to the respondents. Note that once you save your survey, you’ll see its permalink beneath the name. You can edit survey permalinks as you like. Changing the folder will not affect the survey in anyway—the appearance, settings, embed codes, and responses all remain. To change the survey in which the survey is stored, click the drop-down and select the new folder. Then scroll to the bottom of the page and click Save Settings. You can customise the message that is shown to respondents when they start and finish your survey. The custom start message will only appear if you select use a custom start message. Pro and Corporate account holders can set up a custom finish message for their survey or choose to redirect participants to a specific URL after survey completion. You can also display a progress indicator on your survey which will be more useful if you have more than one page of questions. A back button can be added too but be aware that the results from the current page are not saved when the user clicks Back. Note that an incomplete response is still classified as a response. You can also re-open a closed survey once the automatic closing time has passed. A closed survey will appear with a red circle next to its title. You can click that red circle, which will turn it into a green circle, and the survey is open again. Sometimes, question numbers don’t make sense in a survey. You can uncheck Show question numbers to remove the question numbers from your survey. 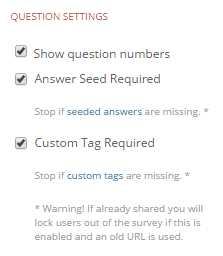 If you use custom tags or seed your survey data you may have become frustrated if users have removed the tagged or seeded data from the survey URL. By enabling either of these settings the survey will stop loading until the user loads the correct URL. Enabling these settings will disable some collection methods that do not work with seeded data or custom tags. Change this option to determine how many times a user can complete a survey. You can restrict who has access to your survey by protecting it with a password or limiting access by IP address. When you enable the password option, a password is required to participate in the survey. You can read more details on this option on the password protection for surveys and quizzes support page. This will allow all IP addresses from 224.120.1.1 to 224.120.1.255. Email restrictions allow you to specify a whitelist of email addresses that are allowed access to your survey. The survey response will only be registered when the participant clicks on a confirmation link sent to their email address when they complete the survey. You can read more details on this option on the email address for whitelisting support page. Captcha entry protection forces the participant to fill in a captcha form before the participant is allowed access to the survey. This is a good way to prevent automated responses by scripts/bots. First, you’ll want to create a survey or create a quiz. Once your questions are set up, you can select Randomize the questions on this page, located in the top, right-hand corner of the survey / quiz question editor. Now, when participants attempt your quiz or take your survey, they’ll see the questions appear in a random order on each time. Question randomization cannot be used with question branching/forking. Question branching sets a deliberate path through the survey based on criteria that you choose. Randomization shows the questions in a random order. Using the blue scrollbar you can scroll through the styles. Click a style to select it. Advanced users can make use of the custom style feature which allows you to define your own CSS. Selecting this will display a custom style selector. Select one of your existing custom styles, or create a new one. When you assign a custom style to your survey, click Save Settings. You can customize the languages for your survey on the Edit Language page. It allows you to change the text on certain elements of the survey, such as the submit button, etc. You can even change the default English text to any language of your choice.